Aerial photo of Merrillville, Indiana looking east over US 30 towards the I-65 interchange. 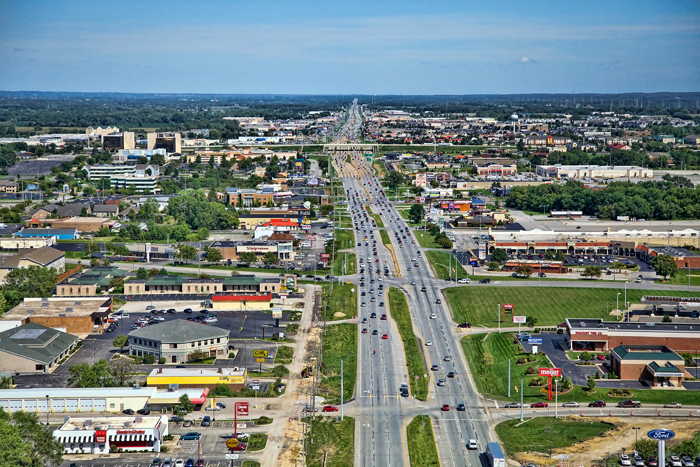 Many businesses along this busy corridor can be seen, including the Twin Towers, Meijer, Star Plaza Theater, Westfield Southlake Mall, Old Time Pottery, Walgreens, Steak n Shake, Car-X, and many others. This photo was taken on Saturday, August 18, 2012. I have many more Northwest Indiana aerial photos taken from across Northwest Indiana! Would you like to have an aerial photo of your home or business? I have a large collection of photographs taken along Indianapolis Blvd/Wicker Ave (US 41) and US 30 corridors. Visit my Northwest Indiana aerial photography page or contact me for more information. If you want to order a print of this photo, click on the button below. Using this photo without prior permission is strictly prohibited. For commercial licensing of this photo, please contact me directly. Aerial photo of Merrillville, Indiana over US 30 by Joey B. Lax-Salinas is licensed under a Creative Commons Attribution-NonCommercial-NoDerivs 3.0 Unported License. Permissions beyond the scope of this license may be available at http://www.joeyblsphotography.com.